What’s it Like to Move Your Office and House at the Same Time? 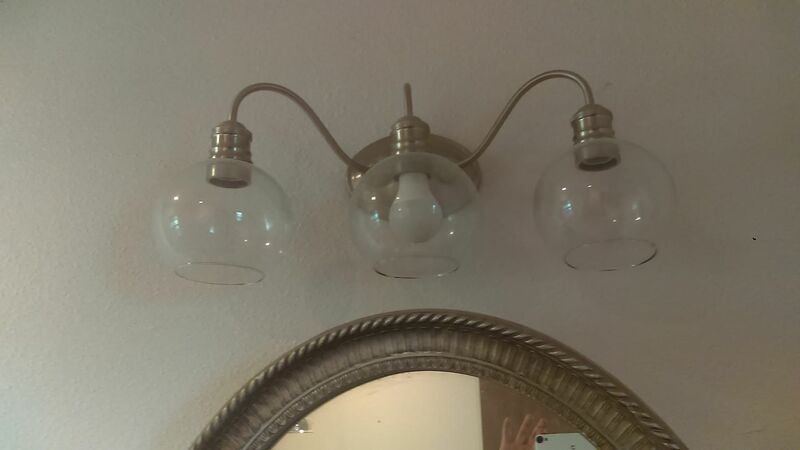 We had a request for a better picture of the bathroom vanity lights. I love these! Very reasonable price at Lowes. It’s not a lot of fun. 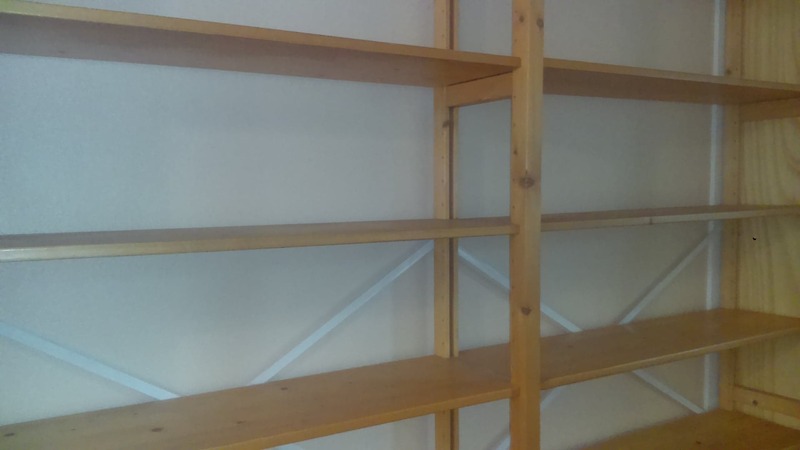 We are incredibly excited to get moved to the church and rent the current office out (to tenants moving to Cameron, who will be a real asset to the community – more on that in another post). We are also very excited for my family to get moved to Rattlesnake and rent out the Travis house I am currently renting. That doesn’t mean that we are excited for the physical moving part of it, though. We are partially packed up, so it makes finding things in the office a little more difficult. Plus it is very bare in my office with the shelves cleaned off, and the furniture all gone except two chairs, my desk, the futon, and a small table. 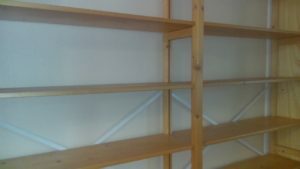 Empty office shelves. It looks a little sad. Not for much longer, though. My house is pretty well packed up. It needs a good, deep cleaning and some repairs before a new family moves in. We can’t do them until we are gone, though. It’s really hard to live out of boxes. We’ve been all geared up to move, and things just keep happening that gets it postponed. It is exhausting and it is frustrating to be living like that for the last couple of months that have passed since we were told “two weeks” the first time. Herding Cats! What Will Happen to Shadow and Patsy When We Move? Sue Ann and I have talked at length about where our office kitties should go, since we have decided to move offices. Neither of us can stand the thought of not having them around, but we have to make a decision in their best interest. The move across town to the church may not suit them. We can’t keep them inside there because Lee is so allergic to cats. We can’t just leave them here to fend for themselves. We don’t do the abandonment thing. AT ALL! They are outside cats, but will try and slip in on occasion. Even though they want to explore the office a bit, they prefer it outdoors really. There is just way more stuff to do. When it froze after Christmas, Shadow stayed in one of the bedrooms at my house. She was separated from my dogs, and had her own spot, but she was not happy being stuck inside. She ended up only staying in for about two hours and I had to let her out. She was going nuts in there. We just don’t believe that either of them will be happy to stay inside all of the time, so they have to be able to go outside at least sometimes. We also talked about how hard it is hard to move an outside cat to a new outside place. The best way to do that usually is to keep them in the new house for a little while until they settle in and know where they are being fed for certain. As mentioned above, we can’t do that without Lee getting really sick. Who could take care of our baby kitties the way we do? Sue Ann and I love them both tremendously, and we want to still be able to have them around and see them. Cats have not had very good luck at the Ranch and Sue Ann worries about their survival out there. 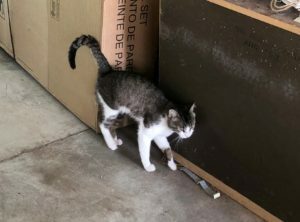 And though Sue Ann’s sister lives next door to the office, we didn’t want to burden her with any more cats to deal with, since she already has a lot of vet bills. What are we to do? Old House, or Traditional Office Building? The building where Sue Ann works in Austin has a nice courtyard, but it’s still a corporate office. 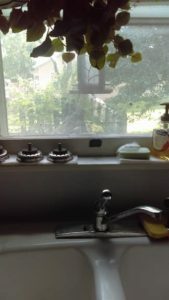 Click to see her actual window. Luckily she has a window. Yesterday our city had a major water line break which caused an outage of water to the entire city, except those few who have wells in city limits (Thanks Dad!). I think that the water was restored sometime yesterday evening between 6 and 8. So here I am this morning at the office bleeding the water lines, and watering our green friends who are not very pleased that they missed the regular Wednesday shower. If you have read any of my blogs about our office, you know my opinion is that it is the most perfect office that ever officed. I did start to think though about what would kinds of buildings are appropriate for what types of offices. This could go into a whole year long blog series, I am sure, but for now, I want to look at 2 of them. Old house offices as opposed to a building devoted for offices. Both of which I have experience with, so while this is an opinion, it is a more educated opinion. Let’s begin with buildings that are built with the sole purpose of being for offices. 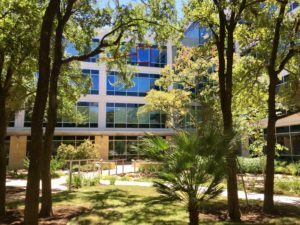 Companies that have several employees greatly benefit from having the space to accommodate more people. These usually consist of some actual closed-in offices, and open spaces for cubicles. You can fit more people into a workspace this way. Think about it like this. If you own a chain of stores and you have a main corporate office, which of these buildings make money? The corporate office is necessary for accounting, human resources, media, marketing, and those types of things, but the products you sell and make money on are at the stores. The stores are where your money is made. That is where you spend the money. You spend the money on those to make them bigger, cleaner, brighter, hold more equipment, and all of these wonderful things that we shoppers expect. My son asked if they were buzzards. I answered that they are just bald yet. 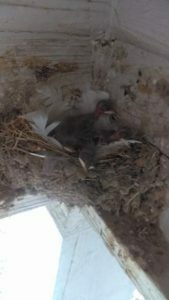 When I arrived at work on Thursday and opened the door to let the day begin, my son brought to my attention that we had tiny baby birds in the nest on the front porch. I think I squealed with delight for about 10 minutes, made my oldest climb a chair and take pictures, then squealed for another 10 minutes when they heard the click of the camera and hung their heads over the nest. What a really sweet way to start the day! I will knock a wasp nest down quick, but I always leave bird nests even if I think nothing is in it. Hard to see, but if you click on the picture, you can see his little back and tail. Our back yard is alive with birds and squirrels. I caught this little guy at left inspecting an older feeder outside, and he stared into the kitchen for the longest time until I snapped the picture and he turned his head at the last second. It is so neat to work here! We have our green POTTED babies, and we have our birds and our squirrels who are around to visit us. I can hear traffic, but I also hear the chirping of birds, the wind chimes, and the wind blowing when it gets high. Rainy days are actually cool here, because I can see it out of the window and watch the little critters all take cover from it, plus I get to watch our green babies thrive in it. I’m always learning something from Lee! I have learned many things in a short amount of time. Every project is an opportunity for me to learn and grow, no matter how involved I am with it. 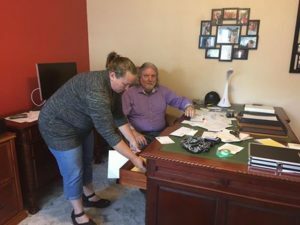 Some of the things I have learned are working Quickbooks, the pros and cons of keeping a property as a rental, and making sure that every contractor you use has a W-9 filled out, so that you can claim the work on your taxes. Quickbooks first. I had never even looked at Quickbooks before I came to work here. Now, I still have areas that need improvement, but I am navigating much easier. I am also learning how to document what bills have been paid when and am working on a two point check system to make sure these are done every month. I am certainly more settled with the way things flow than I was. I can give a close estimate as to which bills come in and when, a ballpark amount, who the vendor is, and which business is responsible for the payment. That helps greatly! I still make mistakes here and there, but in the mistakes I have an opportunity for growth. The mistakes give me a chance to figure out how to fix those mistakes in the future. We’re all human and we all make mistakes no matter how many times we do or have done things. It helps to have patience from your boss to make those mistakes and the realization that you are still learning and these mistakes are necessary to move forward. One thing that Lee discussed with me last week was whether or not it would be more profitable to keep the Meadow Arbor 1 property as a rental, or to sell it outright, right now. In that discussion and through my own train of thought, I could see that it would be more profitable to keep it for now and make more money it, then sell it in a few years when we have made a decent amount on it. We also discussed what to do if all of the sudden the neighborhood depreciates for some reason. I learned the difference between cash flow and negative cash flow in those cases. Am I ready to start my own business and do what Lee does? Not hardly! But I have a unique opportunity with a teacher who would like me to have enough knowledge to have that option if I chose it.